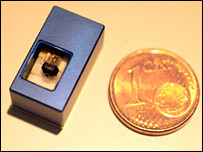 16×9 mm in size it will project the size of a regular projector on the wall. But not in green. Because green lasers are too frickin’ big man. It uses one vibrating mirror to spread the light – instead of the loads of mirrors other projectors need.